The Jellystone 'Original' Necklace is comprised of 7 chunky beads secured with a practical break-away clasp. The cords can be adjusted to suit and the necklace easily cleaned with soapy water, a wet wipe or even in the dishwasher. An ideal accessory for active moms, safe for babies and suitable to wear during sport or while swimming. 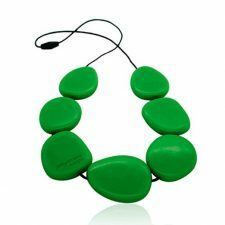 Jellystone Jewellery is free from BPA, Phthalates and PVC with a fabulous soft-feel and texture. The practical jewellery products are suitable for modern women with (or without) children. The necklace range includes BPA-free large, chunky pendants and necklaces secured with practical break-away clasps, custom-designed to separate easily when tugged or snagged. Please note: necklaces are not to be worn by children under 3 years.